Safe to say, On the Beach isn't the cheeriest of reads. 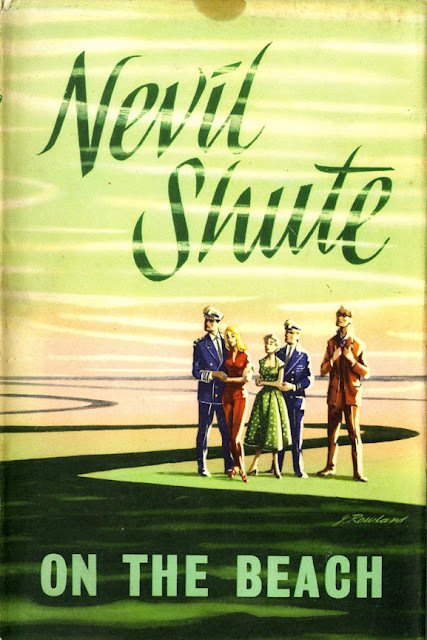 Shute is admirably clear-eyed about the aftereffects of nuclear conflict: with radioactive particles drifting ever-closer to Australia, we're left in little doubt that the situation is hopeless and humanity's days are numbered. But in common with other end-of-the-world novels of the era, Shute's characters exhibit a stoic resolve in the face of annihilation, a stiff-upper-lipped Britishness – or, more accurately, Australianness – not dissimilar to that displayed in, say John Wyndham's more SF-leaning stories. 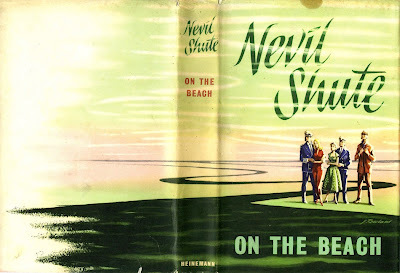 Nevil Shute was a phenomenally popular novelist in his day, but in recent years has been a bit overlooked, although, as Robert McCrum mentions in this recent Guardian piece, that's starting to change. 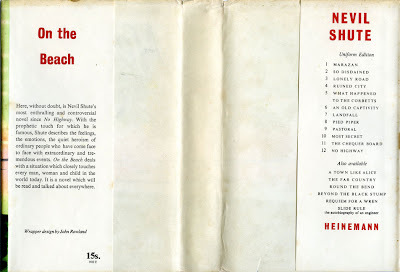 But On the Beach is a powerful and convincing piece of fiction; on the strength of this novel, I'll certainly be trying a few more Shute books – and considering I've recently bought a couple of other Shute first editions in Lewes bookshops, I can do just that very thing. 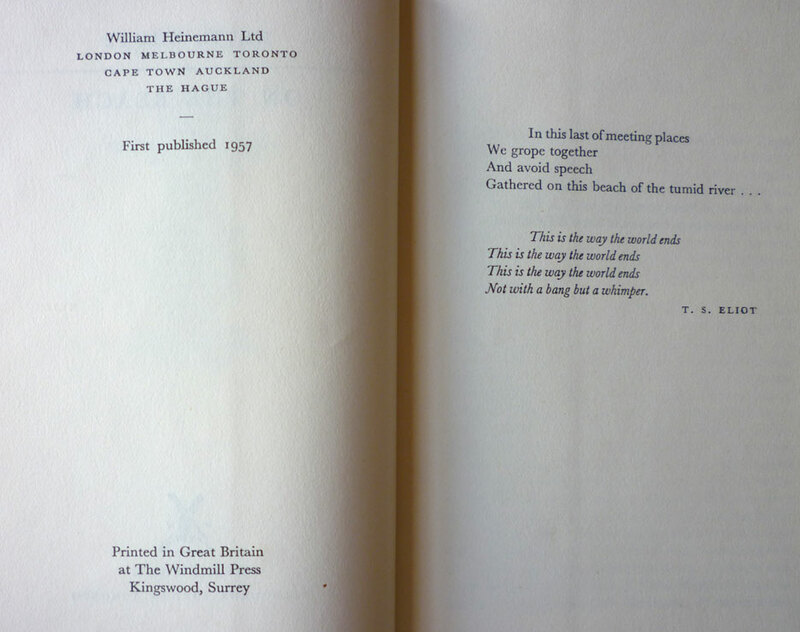 I found this first edition/first impression of On the Beach in Kim's Bookshop in Chichester during my summer holidays, and it's in pretty good nick for its age – a bit of foxing on the page edges, but the dustjacket, aside from a blemish at the top, is bright and, best of all, complete (jackets on these Heinemann firsts are notoriously fragile and prone to chipping on the spine). 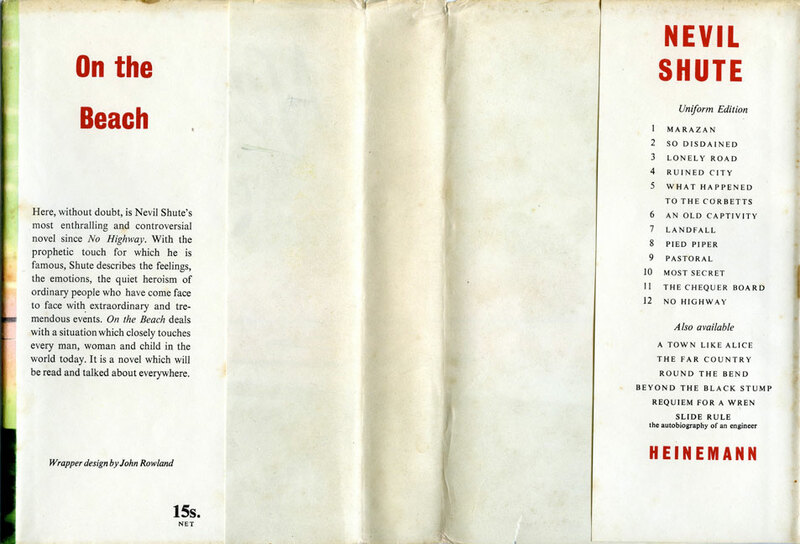 It was designed by John Rowland, who created a number of other Heinemann jackets around this period, among them another Shute novel, Stephen Morris (1961), and a handful of Anthony Burgess novels: Beds in the East, 1959; The Doctor is Sick, 1960; Devil of a State, 1961; and The Worm and the Ring, also 1961, copies of which are very scarce due to it being pulped following the threat of libel action. Published by Heinemann in 1956, Elleston Trevor's The Killing Ground is a World War II-set tale centring on the August 1944 battle of the Falaise Pocket, the climactic encounter of the D-Day invasion. 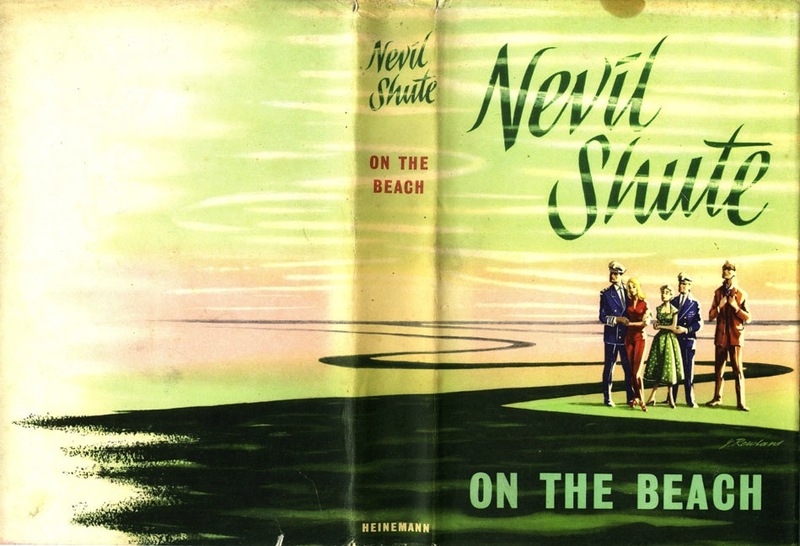 John Rowland's dustjacket for this one isn't quite so colourful as his On the Beach wrapper, but in its restricted palette, subdued hues and use of chiaroscuro, it typifies a certain style of jacket illustration of the period. Sorry, that ON THE BEACH cover is pretty poor. 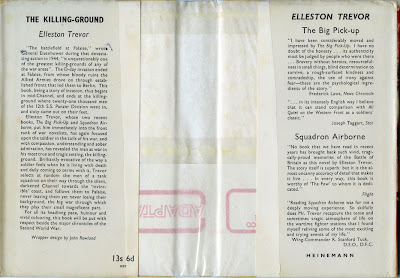 Not a clue as to what the story's about, or whether its a travelogue, a crime novel, a drama, a bio, a ... whereas the KILLING GROUND one is much more effective in pulling a potential reader into it. Opinions may vary, of course. 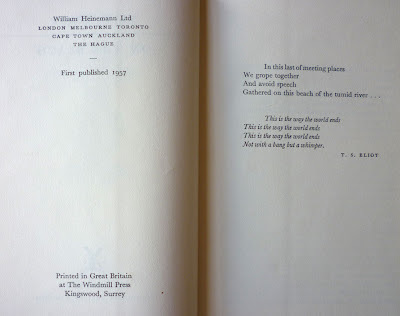 They may indeed, Mr. Wolf, and I welcome yours. 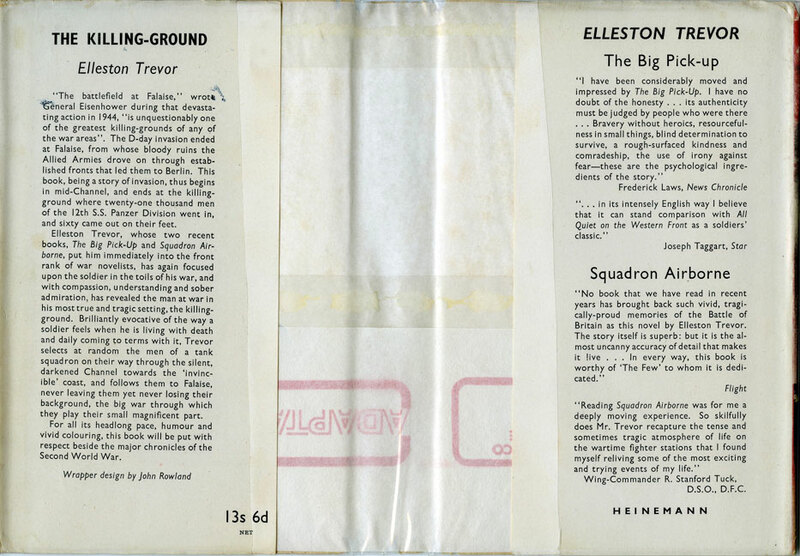 However, in its defence, I'd say that, while you're quite correct Rowland's On the Beach jacket doesn't really tell you what the novel's about, it is quite intriguing. I recall seeing an image of that cover before I even knew what the book was a about, and it made me curious about the story. Who were those people? Where are they standing? Why are some of them in uniform? 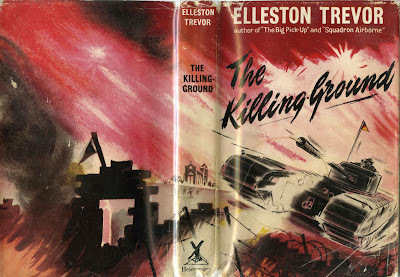 I'm a great believer in un-literal or subtly allusive covers: they can draw a reader in just as well as a cover with a stonking great tank on the front, I find. 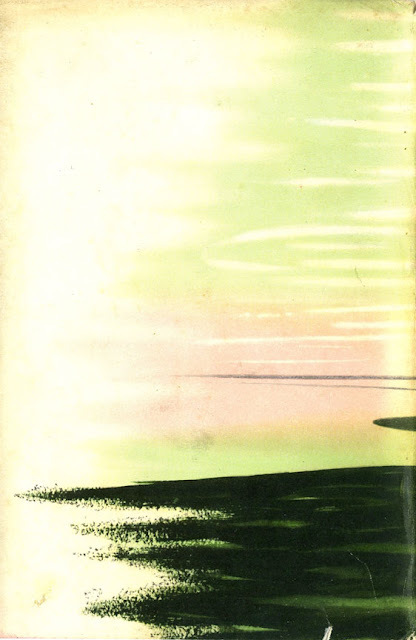 The next cover I'll be showing is just as abstract as the On the Beach one, but again, it's mysterious and intriguing. But that aside, aesthetically speaking, Rowland was evidently a fine illustrator, and I could happily spend a good while just gazing at his book covers.